We've been uploading the "before and after" cards to the card gallery - if you're not on Facebook (where they've been posted each morning), check them out in the gallery! OWHtv is coming up tonight at 6:30pm Pacific...don't forget to tune in! Winners from last week's show will be announced - all eight of them! Our Muscle Card Challenge is underway - cards due April 30, but sooner is MUCH better so we can start the packing of the dad boxes! Did you see the fantastic new digis available from Hop Art Designs through Hambo Stamps? COOL! And now, without further ado...thank you to all these wonderful cardmakers and financial donors this week! 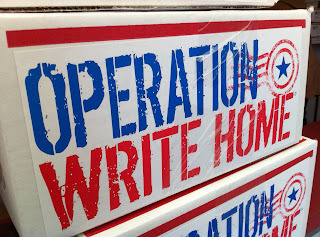 America: Meet OWH's 5,000th box! Gooooooood Thursday to you all! 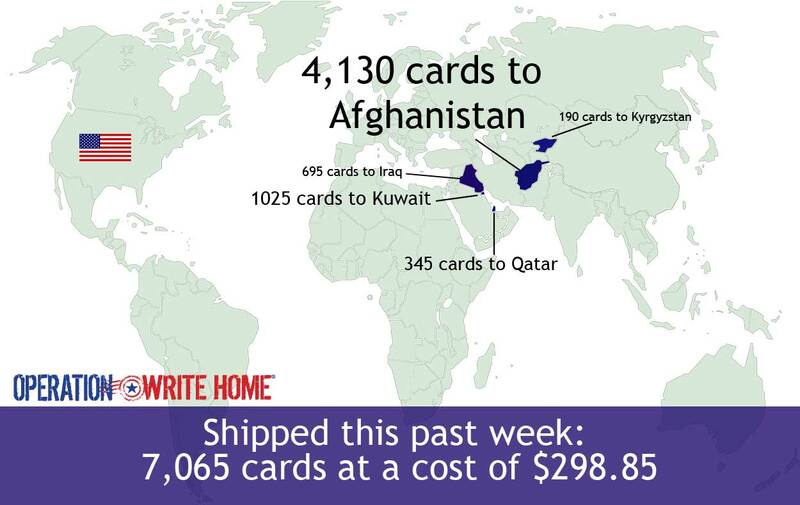 It's time for our roll of gratitude....look at what you are making possible every time you send in cards and funds! These all contain Mother's Day and a selection of all the other themes --- our heroes will love them all! 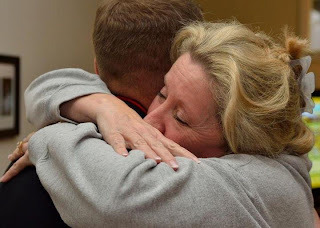 We have our prize winner to pick from the Mothers Day challenge that ended on Tuesday; stay tuned to OWHtv tonight for the announcement of the winner!!! Uhm. I'm putting this blog post together with the help of Punch. He's .... well, extra cuddly right now! It must be because he's grateful to all these wonderful cardmakers. He's lying across my forearms, letting just my fingers reach out to type the keys....lol! So from me, our shippers, our heroes, and Punch...THANK YOU! Another of our heroes is home...but really, have kleenex ready. This week we had less boxes than usual sent out...23 boxes with 7,065 cards at a cost of $298.85. Happy Thursday! How's your week been? We've still been a little lighter on mail than expected...but we're bracing for the coming cards zipping our way before the deadline on March 20! Yes, its the 20th, contrary to all my posts here about the 15th...my apologies for being a bit mixed up! Without further ado, here's our list of fantastic people whose cards made it to our shippers in the past week! Thank you all so much! This week we shipped 42 boxes....10,875 cards at a cost of $512.80! 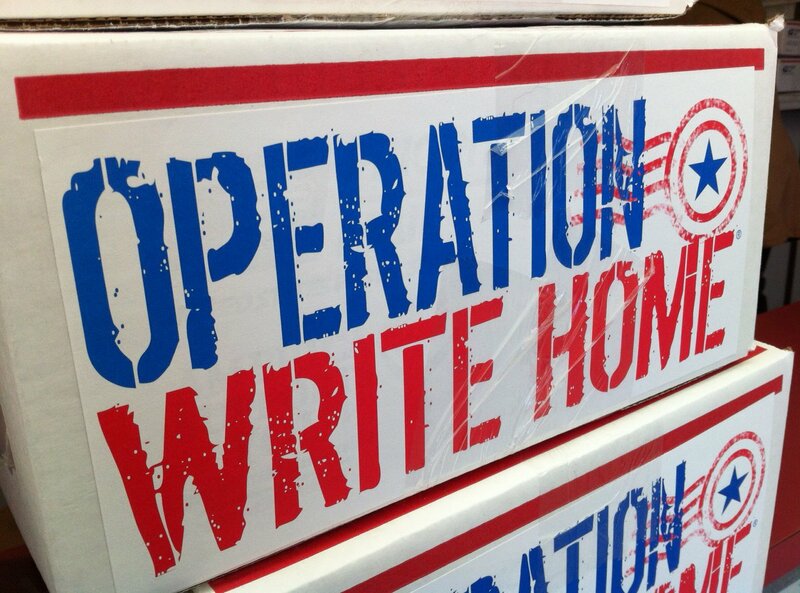 Thank you all so much for keeping our heroes busy writing home! Goooooooood Thursday to you all! Many thanks go out to those who are helping us catch up on our waiting list units and keep up with those we've got already in rotation....you're a big blessing to so many people!! Today's Thursday, of course, and it's OWHtv day - so don't forget to tune in to the show tonight. It's also the first day of March....and we've got something different we'll be trying on Facebook for you. We've had SUCH a big response to the card shares on OWHtv - crafters are loving the simple changes they see that they can make to their cards to make big improvements - so we're sharing some 'before/afters' all month. Each of the pairs is made by me (Sandy) - and will hopefully show you how to take a simple card, sometimes one with sneeze, or something that could just use a little dressing up....and do just a small something to give it a punch. It'll be a bit of work to do it for each day, but the designs will be pretty simple ones so I can keep up! This is today's pair...starting out with a bit of sticker sneeze, brought together with some simple punched circles for organization, and the detail of rounded corners. Haven't seen the card gallery? Oh my! Go check it out here! Thank you to all this week's crafters! !